Why Aquasource? 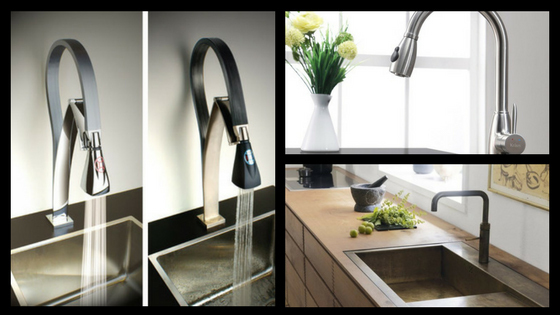 Aquasource is one of the less recognized kitchen faucet manufacturers but this does not discredit them whatsoever. What Aquasource understand is that looks are central to a faucet and they have a distinctly summery, Mediterranean feel to their construction, which only works in their favor. 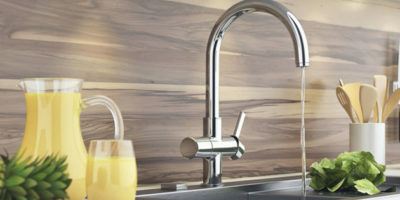 The majority of their faucets come bronzed and ready for easy installation within your kitchen, and what is more, they are incredibly easy to install, with multiple connectivities and a minimum amount of tools required. Listed below are the best Aquasource Faucet reviews for your browsing! 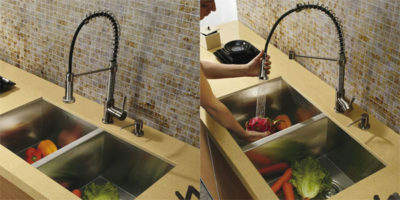 The main faucet offered by Aquasource is the pull-down kitchen faucet. Immediately, you notice that with the rubbed bronze body comes some excellent aesthetic design, with the pull-down head being incredibly easy to grasp a hold of thanks to the design that sees a distinct lip at the bottom, which is never a bad thing. There is also one finely attuned handle that controls the flow of water and temperature incredibly easy thanks to its pull-down nature. The height of the faucet is some 14 inches, with are some 8 inches which mean no issues were had over fitting pans and pots below it, which is excellent. The extendable hose is also very good, with a reach of some 30 inches and the pressure throughout is good, towards the higher end of modern parameters of 2.2gpm consumption. If you require a longer hose, then you will have to shop around for an alternative as Aquasource do not currently stock one to extend upon what is already fitted. However, the inside of the faucet is not metal, it is PVC and users have noted how the faucet is prone to leaking which is disappointing. It is incredibly cheap, however, so if you like in an area of soft water you will probably be served well. Whilst on paper this sounds an incredibly similar faucet to the rest of the Aquasource range, this is actually an entirely different faucet altogether and is one of Aquasource’s newer faucets on offer. The appearance and overall weighting are fantastic, with beautiful looking taps sitting alongside the faucet head and it comes with two functions; the spray cleaner, as well as the more usual stream. Both of these generate good pressure and perform filling and rinsing with ease, and the head, which is plastic is not prone to overheating or being uncomfortable to the user. The hose of this faucet is also well made, constructed out of excellent PVC and it also has a good reach of 30 inches, just like the other faucet on review here. There is even an attached soap dispenser to accompany your faucet head. 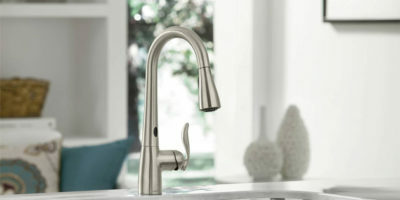 Just like the other faucet from the company on review here, there are key issues over reliability with this particular faucet being reported of leaking well below the surface of your kitchen, in the integral bowels of your countertop. The connector hose is also way too narrow and blocks incredibly easily. Whilst this is one of the more premier Aquasource faucets on review here, it cannot be recommended due to its faulty nature. Disappointing. As previously mentioned, Aquasource has excellent looking faucets and this is due to their rubbed bronze finishes that are also scratch and stain resistant. The weighting is also excellent, with the head of the faucet not being overly large and the taps also being a great size, allowing for an excellent fine tuning to what you require as a user. When they work, Aquasource has some of the best cheap faucets available on the market and when combined with the looks, this will entice multiple users in. None of their faucets is available for more than $240 USD and if you are in the market for something cheap yet beautiful, they will probably float your boat. 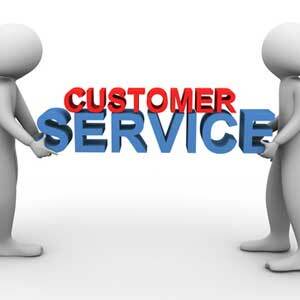 Aquasource also has some excellent customer service, which is a good job as their faucets are so faulty. Even when you seem to have a faucet entirely incapable of working as a faucet, they will happily send you replacements and the warranty is also incredibly solid, which is pleasing to a user. 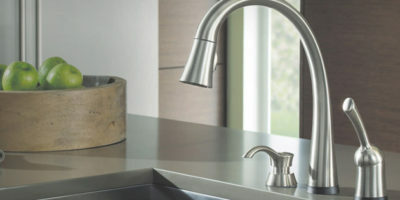 Aquasource is some of the cheapest faucets available and they are also some of the best looking, with an excellent range of finishes available that will appeal to many different styles of kitchens. They are also incredibly cheap, which means that In a market that is full of three figure purchasing prices, this particular brand is slowly gaining more and more recognition. Even with their incredibly dubious reliability. We hope that these Aquasource faucet reviews have been helpful in your quest for a suitable faucet, and if you are interested in the products on review here, feel free to check them out further on Amazon! 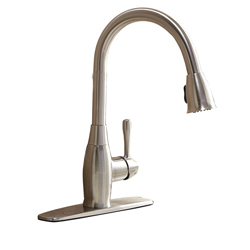 I have a aquasource one handle pull out kitchen faucet. I need to replace the black rubber button on top of the faucet that you push to switch from a stream to a spray. I love my faucet and it still works great just need to replace that. It is wide at the front and more narrow towards the back. I have installed a brand-new faucet from AquaSource and it thumps every Time I turn it on……everything has been checked and doublechecked……whats happening? Hi James, you better contact the shop! I purchased a home in December 2017. 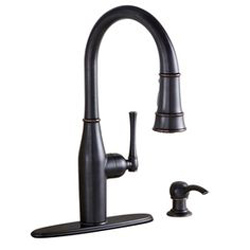 It has AquaSource faucet and sink in kitchen in the oil-rubbed bronze. The faucet on the left for hot water is missing the little button on top. Can you tell me where I can get another? Also, what do you use to clean the sink? I have used Dawn, vinegar and when I used Barkeeper’s Friend, it faded some. I need some instructions, please.